A health-care provider explains the three methods of pregnancy dating—last menstrual period, ultrasound, and a physical exam—and how medical professionals use them. Health-care providers define the stage or length of pregnancy differently than many people might think. When people discuss how far along in pregnancy someone is, they tend to do so in general terms: “She’s in the first trimester” or “She’s four months along.” However, many people have only a vague idea of what those phrases really mean. Medical professionals use a standard set of up to three methods to date pregnancies: last menstrual period, ultrasound, and a physical exam. That way, regardless of where they trained or where they practice, any two doctors dating a pregnancy will predict the same due date or gestational age. However, the timing of the actual delivery is not so predictable. Some women will deliver on their due date, others before, and others after. The body is not on a clock counting down to delivery; natural variation will introduce uncertainty. Here I explain the three methods of pregnancy dating and how medical professionals use them. Health-care providers define the stage or length of pregnancy differently than many people might think. It’s an understandable confusion. Logically, one might imagine we represent a pregnancy by how much time has elapsed since conception. Instead, we most commonly date pregnancies from the first day of the last menstrual period (LMP). 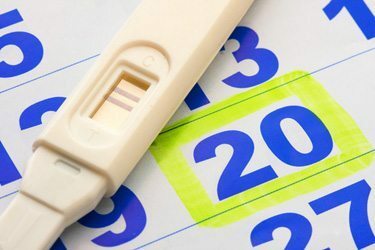 One reason for not dating pregnancies from the day of conception is that we cannot know that day exactly (excluding cases of assisted reproduction), but we can know the first day of LMP, based on what a patient reports to us. Also, when providers all use the same LMP date, we are using one system that provides a standard convention. The average time between menstrual periods is about 28 days, and ovulation occurs about 14 days before the next period begins. So when we say a woman’s estimated gestational age is six weeks’ LMP, we mean she conceived about four weeks ago, around the time of ovulation. The expected duration of a pregnancy is 40 weeks from the first day of LMP (four weeks more than the traditional nine months by which many count). Medical professionals consider delivery premature when it occurs before 36 weeks, and extremely premature when it occurs before 28 weeks’ LMP. It is also important to note that the phrase “late-term,” popularly used by the media to describe later abortions, has no medical meaning and is not used in any medical documentation. It is not used by medical professionals to describe pregnancy length and is solely a political term. Sometimes we do use a trimester system if we are seeking to describe how far along a woman is in general terms. Trimesters, however, have a variability of a few weeks, so they should be thought of as general benchmarks. The first trimester is generally considered to comprise the time up to 12 or 14 weeks from the LMP. The second trimester extends from the end of the first until about 26 to 28 weeks from the LMP, and the third trimester from the end of the second until delivery. Ultrasound can be used to date pregnancies, especially when the LMP is not known (for example, pregnancy after a delivery but before a menses occurred or irregular menses without predictable ovulation). Ultrasound dating is based on a series of measurements of the gestational sac in very early pregnancies and of the embryo or fetus itself as pregnancy progresses. However, unless there is a great difference between what is seen on an ultrasound and what was reported as LMP, doctors still use LMP to establish a due date. For example, if in the first trimester the ultrasound estimate falls within one week of the LMP estimate, we still use LMP to determine due date and length of pregnancy. If the ultrasound estimate differs by more than one week from the LMP, we would use the ultrasound estimate for the due date. This method continues in the subsequent trimesters. In the second trimester, the determination also defaults to the LMP unless the ultrasound estimate is more than two weeks different from the LMP. We follow the same process in the third trimester, with a three-week difference. Pregnancies can also be dated with a physical exam. During a pelvic exam, the uterus can be felt coming over the pubic bone at about 12 weeks’ LMP and at the umbilicus (navel) at about 20 weeks. The uterus then typically rises above the navel at about a centimeter a week after that. But a physical exam can be misleading (due to factors such as twins, uterine tumors, or obesity) and is not used as the main way to date a pregnancy if LMP or ultrasound is available.